One of the great benefits of living in a large city is all the exhibitions, performances, galleries and museums that are readily available to anyone who wants to take an interest. On occasion we go to exhibitions we've heard about, other times we literally stumble upon something interesting on our walks. Last weeks cultural experience was the Momofuku Ando Instant Ramen Museum in Ikeda, Osaka. Instant Ramen, for those that do not know, is wheat noodles cooked in a broth, then flash-fried in oil to dry them, resulting in a square or round noodle "cake". To eat them you simply pour hot water over them and wait for a couple of minutes. 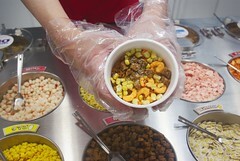 They are usually sold with packets of soup base and freeze-dried vegetables to make a complete meal. They come in flat, square packets; in plastic bowls; or in styrofoam cups. In Sweden I only ever saw the flat packets, while the bowls and cups seem to be most common here in Japan. The inventor was Momofuku Ando, who perfected the idea of drying the noodles by flash-frying them in the 1950's. At first his company, Nissin, sold just the flat noodle packets. He once saw customers cook their noodles by putting them in a coffee mug rather than a bowl, and when he got a styrofoam cup during a flight he hit on the idea of selling the noodles in their own cup. In 1972, the Japanese Red Army took a hostage and occupied a building in the Asama mountains in Japan, in what was to become a ten-day stand-off with the police. Nissin rushed boxes of Cup Noodle to the site of the stand-off, and live national TV coverage of the drama streamed images of policemen gulping down the noodles to households all over the country. The success was complete, and something approaching the perfect fast food was born. A staple food of students, night workers and busy singles, the savoury noodle soup leaves few people untouched when they encounter it, and opinions are frequently based as much on its perceived status and "naturalness" as on the food itself. They're a greasy, salty fast food packaged in wasteful plastic. But they're also amazingly convenient, inexpensive, long lasting, light and flavourful. You can store them for years, making them not only convenient as a back-up food for harried households, but also for stocking emergency supplies and for disaster relief. Today, a Japanese convenience store or supermarket will have many dozens of varieties of noodles, and there's even pots of hot water by the exit so you can buy your noodle cup and fill with hot water on the way out. Ramen currently on sale by Nissin, and the Ando workshop replica. The Cup Noodle museum is in a residential area, right across the street from the Ando family home, and is surprisingly good. We half-expected it to be similar to other self-glorifying corporate museums but this museum clearly wants to reach beyond that level. It is a fairly big place, two floors, and full of visitors. There's a "wall of explanation" of course, but it - and the museum itself - focuses on the noodles and on its inventor, not the company. 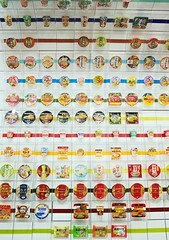 There's a whole wall of instant ramen products (it's a big wall, and getting crowded), and a set of display cases with ramen sold in other countries. 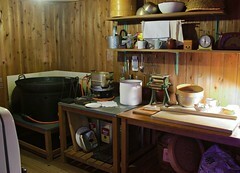 There's a reconstruction of Ando's workshop and a small movie theater running a fun animated information film on making the noodles. The centrepiece of the museum, however, is a "noodle factory" where you can mix your own Cup Noodle (there's even an area where people can make their own noodles from scratch, but that seems to be for pre-booked visitor groups only). You get an empty Cup Noodle cup, and start by decorating it at a table using the coloured pens. Then you go to the "Production Counter", where, first, you get the dried noodle placed in the cup, using a small manual version of the machine used in the real factory (the cup is put over the noodle 'puck', then turned around). You choose the soup base and four ingredients, much like you would at an ice-cream stand. The cup then gets lidded and shrink-wrapped, again using small versions of the real machines. Last, you get to put your cup in a nifty "air bag" to protect it until you get home. Make your own Cup Noodle: When you've decorated your mug a museum guy will place a puck of dried noodles in it. Then choose, ice-cream stand-like, a soup flavour and four ingredients. Once the cup has been lidded and shrink-wrapped you place it in a inflatable bag for stylish transport home. We've still not opened ours, but I'm getting really curious how my mix turned out. 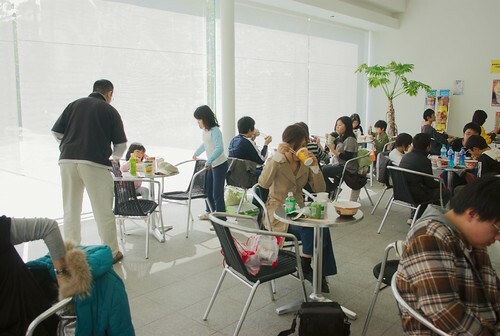 The last part of the museum is a café-style restaurant of sorts. It's packed with people; there was even a bouncer with a velvet rope regulating the flow of people. There are no waiters and no kitchen, of course; instead there's a wall of vending machines selling various versions of instant ramen. You have machines selling standard varieties; old-style noodles of previous eras; special versions produced only for the museum, and trial varieties that are not yet for sale in stores. We each had two kinds: Ritsuko had a classic curry-flavoured Cup Noodle and a Japan Airlines mini-ramen cup; I got an experimental bowl of tonkotsu ramen and a Japan Airlines soba cup. All were good, but I must say the ramen bowl was really excellent. It'll go on sale this spring so it is not the last time I ate it, I suspect. Who goes to a museum like this? Judging from last Sunday it's school classes, parents with children and - surprisingly - many small groups of young, dressed-up women. Why? Don't ask me; I have no idea. 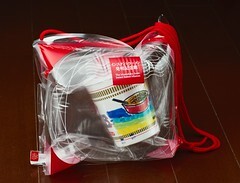 Is a self-designed cup of instant noodles this springs must-have accessory? 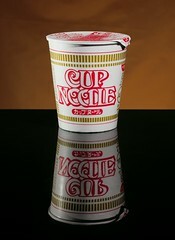 Is Cup Noodle considered a beauty product? Perhaps fashion-forward young Japanese girls simply love instant ramen as much as everyone else, and they have the free time to visit museums. I would love to visit! Sounds so cool. I'm planning our first trip to Japan, and this has been firmly on my agenda since I first stumbled across mention of it a few months ago. Your post gives me a better idea and I can't wait to visit!